ooze, a common symptom of fire blight infections. For apple and pear growers, the detection of fire blight in their orchards usually results in immediate concern, and for good reason. Its ability to kill young trees, the limited number of effective control measures available to control the disease and the explosive nature of fire blight epidemics make it a potentially devastating disease (Figs. 1, 2). Fire blight, which is caused by a bacteria named Erwinia amylovora, is native to the eastern half of North America and was first reported in 1780 on pear and quince in the Hudson Valley of New York. The name “fire blight” was the result of the rapid, almost firelike spread of blackened dead tissue in orchards. In the late 19th and early 20th century the disease made its way to the West Coast of North America and by the mid-20th century to England. It currently occurs throughout North America, in most of Europe, in the Middle East, northern Africa, Iran and New Zealand. It has not been reported in China, South America or South Africa, and was successfully eradicated from Australia in the late 20th century. Pears are highly susceptible to fire blight and the disease has been the main factor limiting pear production in the eastern United States. Over the past 50 years the danger of fire blight in apple orchards has increased to unprecedented levels due to the adoption of high-density orchard systems and recent planting of susceptible cultivars and rootstocks (Fig. 1). A high-density apple orchard system depends upon the use of dwarfing rootstocks. The most commonly used dwarfing apple rootstocks, Malling (M.) 9 and M.26, are highly susceptible to fire blight (Fig. 2). Currently, there are no effective treatments available to protect rootstocks from infection. Furthermore, many commercially successful apple cultivars, including ‘Braeburn’, ‘Fuji’, ‘Gala’, ‘Jonagold’, and ‘Cripps Pink’, are much more susceptible to fire blight than older cultivars. Annual losses to fire blight and costs of control in the United States are estimated at over $100 million (Norelli et al., 2003). Unlike many fungal diseases that reduce the market value of the current season’s fruit crop, losses from fire blight result mainly from diminished orchard productivity due to the loss of trees or their severe structural damage. These types of losses are compounded over several years, making them quite costly; however, compounded losses are more difficult to determine and often less apparent. For example, a 10% incidence of rootstock blight in a 4-year-old high-density planting can result in losses up to $8,400 per hectare when the costs of tree replacement, lost investment in tree establishment and maintenance, and reduced yields over several years are considered (Norelli et al., 2003). apple near Pasco, WA devastated by fire blight. Fire blight is host-specific to the apple tribe (Maleae) of the rose family, and in addition to apples and pears its other hosts include fruit crops such as quince and loquat, and several woody ornamentals, including mountain ash (Sorbus), hawthorn, firethorn (Pyracnatha), Photinia, Cotoneaster, shadbush (Amelanchier), crab apple and ornamental pear (Van der Zwet et al., 2012). Fire blight bacteria are able to infect most plant parts including blossoms, fruits, vegetative shoots, woody branches and rootstock crowns, through either wounds or natural opening in the plant (Figs. 2 and 3). The disease is usually spread to fire blight-free regions by non-symptomatic nursery stock containing the bacteria. Within the orchard, the bacteria are spread by wind-driven rain and insects. Honey bees play an important role in spreading the disease during bloom. 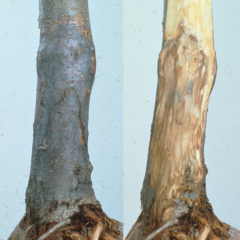 Within the plant, the disease spreads systemically, resulting in the death of woody tissues (Fig. 3). The management of fire blight requires an integrated approach of cultural practices, such as pruning out cankers from previous infections, spray treatments to prevent infection, and the planting of resistant cultivars (Norelli et al., 2003). Several models based on climatic and phenological data have been developed to predict the occurrence of fire blight infection periods during bloom, thus improving our ability to control this phase of the disease by the timely application of antibiotic sprays. However, the fire blight bacteria has developed resistance to streptomycin, traditionally the most effective antibiotic for fire blight control, in most production regions. Although blossom blight control has relied heavily on the use of antibiotic sprays to prevent infection, progress has also been made in the biological control of blossom infection, and some biological control products are now commercially available. Although increasing host resistance has been recognized as an important component of fire blight management, its application has been limited by a lack of esistant varieties suited to commercial needs. There are many known sources and defined quantitative trait loci (QTL) for fire blight resistance, but most of these are found in wild species with poor fruit quality. Because the quality of their fruit is irrelevant to the performance of rootstocks, fire blight-resistant apple rootstocks have been developed by conventional breeding much more quickly than have apple scion cultivars and several fire blight-resistant rootstocks are beginning to be commercially available. The development of donor parents for scion breeding containing multiple QTL for fire blight resistance and the development of new apple cultivars with durable resistance to fire blight are both goals of the current RosBREED project. Norelli JL, Jones AL, Aldwinckle, HS. 2003. Fire blight management in the twenty- first century: using new technologies that enhance host resistance in apple. Plant Disease 87(7):756-765. Van der Zwet T., Orolaza-Halbrendt N, Zeller W. 2012. Fire Blight History, Biology and Management. The American Phytopathological Society, St. Paul, Minn.
Vanneste JL (ed). 2000. Fire Blight: the Disease, and Its Causative Agent, Erwinia amylovora. CABI Publishing, NY, NY and Oxon, UK.